My mother has recounted to me how when I was a prisoner of war in Vietnam, she sometimes overheard my father praying for me. He was in charge of U.S. forces in the Pacific at the time and suffered from the burden of commanding a war in a country where his son was imprisoned. As my mother recalled, she could hear my father in his study, on his knees, beseeching God to "show Johnny mercy." My father would have been surprised to know what unlikely forms God's mercy could take. In prison, my captors would tie my arms behind my back and then loop the rope around my neck and ankles so that my head was pulled down between my knees. I was often left like that throughout the night. One night a guard came into my cell. He put his finger to his lips signaling for me to be quiet and then loosened my ropes to relieve my pain. The next morning, when his shift ended, the guard returned and retightened the ropes, never saying a word to me. A month or so later, on Christmas Day, I was standing in the dirt courtyard when I saw that same guard approach me. He walked up and stood silently next to me, not looking or smiling at me. Then he used his sandaled foot to draw a cross in the dirt. We stood wordlessly looking at the cross, remembering the true light of Christmas, even in the darkness of a Vietnamese prison camp. This guard was my Good Samaritan. I will never forget that fellow Christian, and I will never forget that moment. I will always remember as well the Christmas services that my fellow prisoners and I held in a cell, when I gave thanks to God for the blessings he had granted me with the company of men I had come to admire and love. In the life of our country, faith serves the same ends that it can serve in the life of each believer, whatever creed we might profess. It sees us through life's trials. It instills humility, calling us to serve a cause greater than ourselves. At its best, faith reminds us of our common humanity and our essential equality by the measure that matters most. A living faith calls us as well to care for the most vulnerable members of society. The poor, the hungry, the stranger seeking shelter and the child waiting to be born  all are in need of our compassion and protection. Faith shows us that the weak and defenseless are not a problem but rather a priority, and a chance for us to live out the message of the Gospels. That message can reach into any place, however dark. Even in solitary confinement, when everything else has been taken away, nothing can separate us from the love of our Creator. 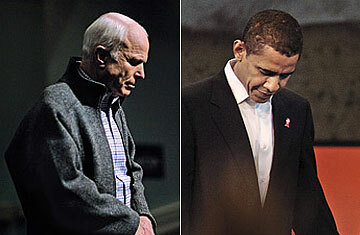 See pictures of John McCain on the campaign trail. See pictures of John McCain's family tree.